For the second year running, Dr. David Forrest of the Virginia Institute of Marine Science has added his contribution to the multi-model “ensemble forecast” that the National Oceanic and Atmospheric Administration uses to predict the size of the low-oxygen “dead zone” that forms off the Mississippi Delta each summer. Fueled by human activities that release excess nutrients into rivers, streams, and groundwater, dead zones are a growing threat to marine life in coastal areas worldwide, including Chesapeake Bay. The NOAA-supported models predict the 2015 Gulf of Mexico dead zone will be approximately 5,483 square miles, about the size of the state of Connecticut. That’s average compared to recent years, but many times larger than what existed before human influences greatly expanded the dead zones’ extent and impacts. NOAA officials say this year marks the first time the results of four models were combined. The four model predictions ranged from 4,344 to 5,985 square miles, and had a collective predictive interval of 3,205 to 7,645 square miles, which take into account variations in weather and oceanographic conditions. The NOAA-sponsored Gulf of Mexico hypoxia forecast has improved steadily in recent years, a result of advancements of individual models and an increase in the number of models used for the forecast. Forecasts based on multiple models are called ensemble forecasts and are commonly used in hurricane and other weather forecasts. Kathryn D. Sullivan, Ph.D., under secretary of commerce for oceans and atmosphere and NOAA administrator, says “NOAA, along with our partners, continues to improve our capability to generate environmental data that can help mitigate and manage this threat to Gulf fisheries and economies. We are adding models to increase the accuracy of our dead zone forecast." 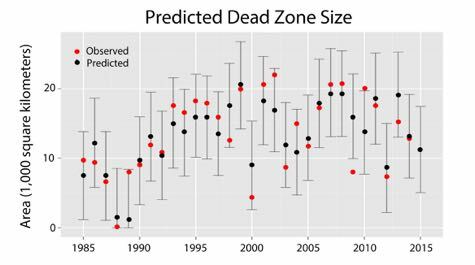 The dead zone’s actual size will be measured between July 28 and August 4 during a monitoring survey led by the Louisiana Universities Marine Consortium, which has been performing this service on an annual basis since 1985. The monitoring team will release its results in early August. NOAA and other federal and stage agencies use the forecasts todetermine the nutrient reductions needed to shrink the dead zone’s size and to test the effectiveness of different management actions in the vast Mississippi River watershed. Forrest’s prediction—based on a statistical correlation between the size of the Gulf dead zone and the average measured load of nitrogen in Mississippi River discharge during May—takes its place among similar forecasts developed by NOAA-sponsored modelers at the University of Michigan, Louisiana State University, theLouisiana Universities Marine Consortium, Texas A&M University, North Carolina State University, and the U.S. Geological Survey(USGS). Forrest’s model is based on the findings of a research paper published in Environmental Research Letters in 2011 with Robert Hetland and Steven DiMarco of Texas A&M University. In addition to river discharge and nitrogen concentration as measured in the Mississippi in May, their research showed the size of the Gulf dead zone also correlates with wind speed and direction along the Louisiana-Texas shoreline in mid-June to mid-July, and the region’s growing sensitivity to nutrient inputs since 1993. All the models in NOAA’s multi-model forecast rely on nutrient-loading estimates from the USGS. The USGS operates more than3,000 real-time stream gauges, 50 real-time nitrate sensors, and collects water quality data at long-term stations throughout theMississippi River basin to track how nutrient loads are changing over time. The USGS estimates that 104,000 metric tons of nitrate and 19,300 metric tons of phosphorus flowed down the Mississippi and Atchafalaya rivers into the Gulf of Mexico in May 2015. This is about 21 percent below the long-term (1980-2014) average for nitrogen, and 16 percent above the long-term average for phosphorus. "Real-time nitrate sensors are advancing our understanding of how nitrate is transported in small streams and large rivers, including the main stem of the Mississippi River,” says William Werkheiser, USGS associate director for water. “Long-term monitoring is critical to tracking how nutrient levels are changing in response to management actions and for improving modeling tools to estimate which sources and areas are contributing the largest amounts of nutrients to the Gulf. "